Microdermabrasion is a skin rejuvenation service. It uses minimally abrasive elements to gently smooth your skin, helping to treat scars, discoloration, sun damage, and stretch marks. If you want to breathe new life into your skin, this may be the treatment you need. View our pricing. You may also want microdermabrasion if you’re worried about crow’s feet, laugh lines, or undesired skin features. Microdermabrasion starts with exfoliation, but that’s not it. The process also helps to rebuild collagen. Collagen fibers help your skin to look taut and youthful when you’re young, but as you age, collagen production naturally starts to wane. That leads to wrinkling or loose skin. Microdermabrasion is a relaxing and non-invasive way to slow the aging process by encouraging your body to produce more collagen. 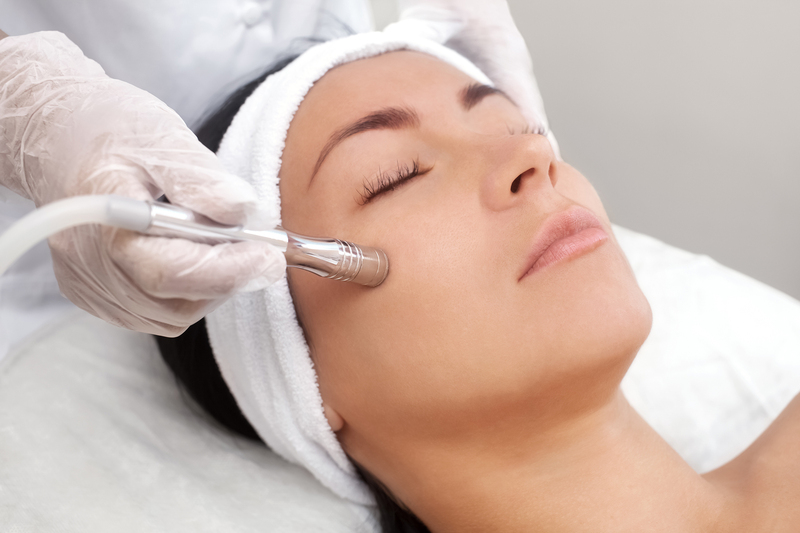 Microdermabrasion can involve aluminum oxide crystals, sodium bicarbonate crystals, or sodium chloride crystals. Your aesthetician uses special suction equipment to gently lift a small section of skin and bring its impurities to the surface. Then, they apply the crystals to exfoliate your skin. In some cases, small diamonds or brushes can be used in this process, but generally, that happens before suction is applied. During the procedure, you can ask your aesthetician to adjust the pressure as needed on your face. Note, however, that the process feels gentle. Although these two processes sound the same, they have key differences. These procedures are similar in that they are both designed to exfoliate and rejuvenate your skin. However, with dermabrasion, your dermatologist essentially sands your skin with an abrasive brush, and to deal with the discomfort, most people need to use numbing medications. In contrast, microdermabrasion is a much gentler process, and numbing is not necessary. Microdermabrasion does not require a lot of down time. In most cases, your skin will be mildly pink for about 24 hours after the procedure. In contrast, with dermabrasion, recovery can take six to eight weeks. After a microdermabrasion session, you should avoid excessive sun exposure for the next few days and wear sunblock to protect your skin. To keep your skin as supple as possible, use moisturizers, and consider avoiding makeup for a day. If you want your skin to look softer and brighter, call us today to set up a microdermabrasion appointment. At a Touch of Las Vegas Spa, we offer microdermabrasion as well as a variety of other facials including anti-aging facials, signature golden caviar facials, purifying facials, nourishing oxygen treatments, and deep pore cleansing. We can also customize a facial based on your skin type and objectives.